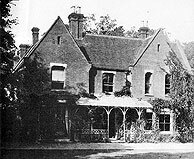 The history of Borley Rectory begins with the building of a gothic Benedictine monastery in the 13th century. Those were not genteel times and legend has it that a monk and his lovely young love-interest, a nun from a nearby convent, were both done-in while trying to elope the establishment and start a new life together. They were captured and the monk was hung while his fiancé was walled up, alive in the cold walls of her convent. Two lovers torn apart to be isolated forever… Was it she who had been seen wafting through the garden, head bent in sorrow? Was she the girl in white who roamed the property searching for her lost love? The involvement of Harry Price came about after a paper asked him to investigate these poltergeists activity following a popular story written by the paper. It was during his investigation that writings on the wall started to appear, usually when Marianne was present. The writing’s ghostly owner seemed more sympathetic to Marianne compared to the other ghosts as some of the messages scrawled were, “Marianne, please help get” and “Marianne light mass prayers”. Price was more of a guest at the manor until the Foysters moved out in 1935 at which point he leased the house for a full year for deeper investigation. Now that Price had the house to himself for an extended period, he ran an ad for other paranormal investigators to help him monitor and document the ghostly activities. He had to weed through some not-so-savory types though, but he ended up working with 40 people to uncover some of the fascinating history of Borley Rectory.